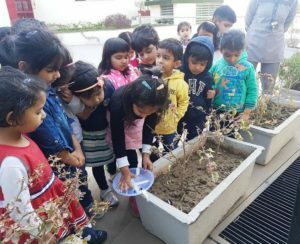 Gurugram: Vega Schools hosted their ‘end of the year project-exhibition’, a first ever initiative in this space. This exhibition was a culmination of a yearlong effort by students and marked the completion of the first batch at Vega Schools. It was for the first time in Gurugram, that a school working on the principles of ‘project-based learning’ has ever held an exhibition that has been completely designed and driven by students, starting from Nursery to Grade 4. The unique project-based learning model taught at Vega Schools is designed by Dr Steven Edwards, former White-house and United Nations consultant, who has been involved in the field of education strategy and training for over 40 years. The successful completion of projects led by learners and supported by their learning leaders, resulted in products like brochures, nukkad naataks, travel guide books and pollution reduction solutions. The end projects created were close replicas to real-world products, thus giving Vega learners early exposure to real life solutions and making them future ready for a competitive world. Each grade displayed its project complete with their ‘ilead’ cycles that explained the learning journey they had undertaken-from the probing questions to planning, procurement of knowledge and reflection. Each Grade had its own specific theme and topic, which enabled them to draw up and display unique solutions in a sustainable manner. The solutions ranged from carpooling and pollution reduction solutions to budgeting, costing and the explanation of the thought process behind where they would like to live and travel. By presenting these topics, independent of their leaders and parents, students incorporated the math, science and language skills they had learned and applied throughout the year. As the learners explained the projects to the parents and guests, they displayed various 21st century skills like coordination, communication, collaboration, creative thinking, comparing, contrasting and decision making etc. Skills that are important at this turn of the 21st century. In contrast to the regular parent-teacher meetings or report card days, which every student dreads, Vega challenged the status quo and turned a final submission into a day filled with fun and learning.